So the long mooted Apple iPad is finally here. It’s a device that’s supposed to take on netbooks at their own game and win, stop working on the train or plane being an ergonomic nightmare that leaves you with cramp, and make Apple fanatics feel special again for owning one now the world+dog has an iPhone. But it’s also a useful tool for designers, illustrators and digital artists looking to get creative on the move. Before we kick off, here’s a quick rundown of the what Apple has dished up. The Apple iPad is a slate PC that looks like a big iPhone. It has a home button and an aluminium bezel like a MacBook. The 9.7-inch touchscreen is made of glass. It’s only half an inch thick, and weighs just 680g (about half a smallish laptop). It contains a 1GHz Apple A4 chip, which is both processor and graphics. 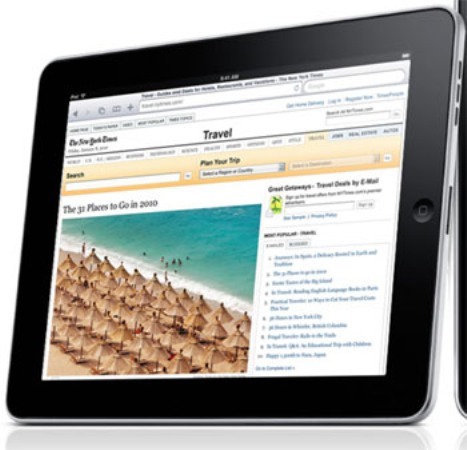 The Apple iPad will come with 16GB, 32GB, or 64GB of flash solid state storage. There’s 802.11n Wi-Fi for use at home and in cafes, Bluetooth 2.1 for keyboards and other peripherals (there’s also a hardware keyboard dock), and optional 3G for connectivity on the move. You can run iPhone apps on it, as well as iPad-specific tools such as a custom version of the iWork office suite – and download e-books like the iPhone’s capabilities for music and videos. In the US, pricing for is between $499 (£310) to $829 (£515), though the 3G capable models are being sold without being tied to lengthy contracts. UK pricing and availability hasn’t been announced, though will likely have a less expensive outlay for the 3G models — but tied to 18-24 month contracts. Autodesk’s Sketchbook Mobile opened up the iPhone for artists to doodle in spare moments while waiting for trains, tubes, mates in bars or elsewhere. The iPhone has limited touch sensitivity but it’s main problem for this task is the small, low-res screen. The iPad is much larger and offers a resolution of 1024 x 768. It’s no mobile Wacom Cintiq though, as it’s unlikely to have a professional-level of touch sensitivity (I’m speculating a bit here, though if it had, Apple would sure shout about it). While Autodesk hasn’t announced an iPad specific version of Sketchbook Mobile, the iPhone version will run on it. As part of the launch, Steve Jobs demonstrated the popular Brushes app on the device. Again you can use your iPod to show off your portfolio, using something like Quark’s new I Love Design app. Again screen size and resolution is an issue, so the iPad will allow you to show off your work in all it’s glory. Interactive designers should beware though, as running the iPhone operating system, there’s still no support for Flash sites. The nature of reading a newspaper, magazine or book on a train means that you’ll appreciate the pleasurable layouts of print more than the strict segmented grids of websites. Hopefully this means that publishers will invest in design (and designers) for iPad versions of newspapers and magazines. Creating digital versions of magazines won’t be as easy as taking your print layout and exporting an iPad version along with your press-ready PDFs — even at the iPad’s 1,024 x 768 resolution, an A4 magazine page with 8-point body copy won’t be readable. Whether this means more jobs for designers, or cruddy replicated layouts depends on whether the interactive magazine model takes off and provides enough revenue to support good design (as well as the whims of individual publishing houses). For interactive designers, there’s hope that the iPad will enable more creative use of interactivity. We’ve seem some incredible demos of what you can do with interactive newspapers and magazines — the best of which is Bonnier’s Mag+ — but these are so much more expensive to create than print magazines in terms of time and manpower necessary. This will limit opportunities here to the biggest newspaper and magazine publishers only. As with the iPhone, where the iPad will create more work for interactive designers is in creating branded projects for clients. And with Flash CS5 mooted to offer a simple ‘output for iPhone/iPad’ export system, creating apps could be simpler, quicker and more suitable for small projects than you’d expect. Looking like a giant iPod, the iPad is ideal for recreating Dom Joly’s classic “I’m on the train” sketch. Yeah, it’s a joke that’ll get tired quickly — all the more reason to get one quickly and get in first.